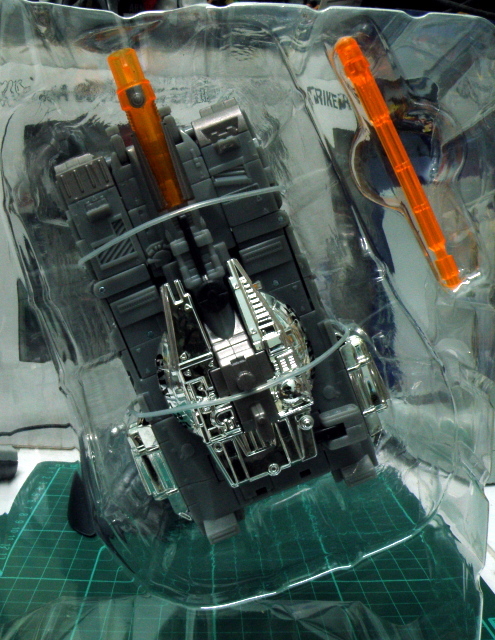 Transformers Henkei Galvatron – Tank mode | Out of the box. Born/remade/reformat from the broken body of the Decepticons/Destron undisputed leader; Megatron . Galvatron is the new embodiment of the Decepticons/Destron new generation leader. 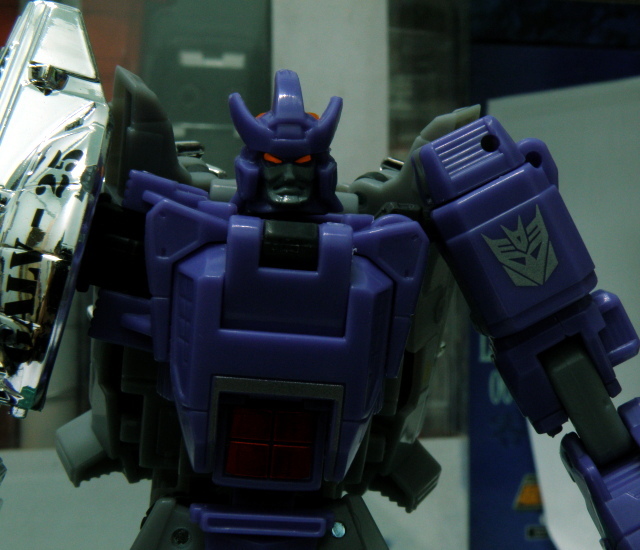 Galvatron the new face of tyranny. 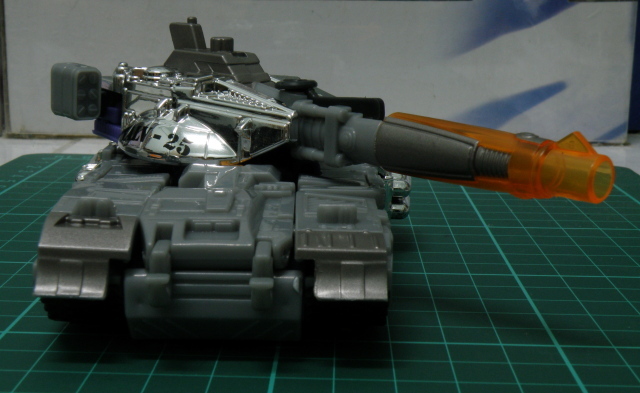 In the rendition of the Henkei toy line Galvatron alternate mode is a battle tank. In the original series, it was a futuristic looking howitzer. The firepower is so powerful that it can pulverize StarScream with a single shot. The package of the toy is in cardboard with encased by bubble plastic. The back of the cardboard has the robot feature, statistics, biodata all in Japanese. There is no accessories for Galvatron, the only additional part is the spring loaded projectile. Don´t worry it won´t shoot your eyes out. 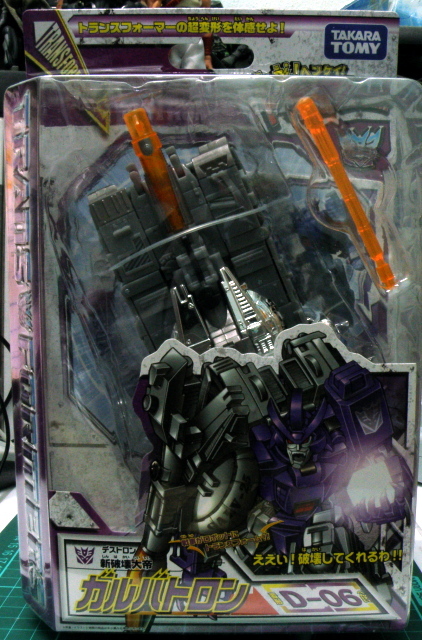 Galvatron in alternate mode out of box. Like others Henkei toy line it has transformation instruction and henkei comic with the Galvatron character collectible card. 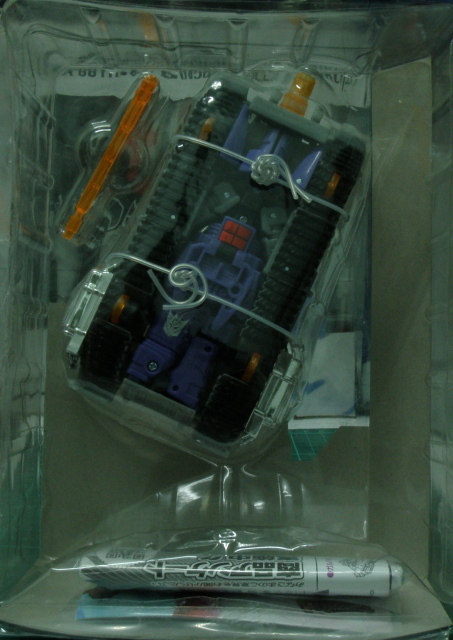 Out of the box in alternate mode, Galvatron is tied securely to onto the bubble plastic. 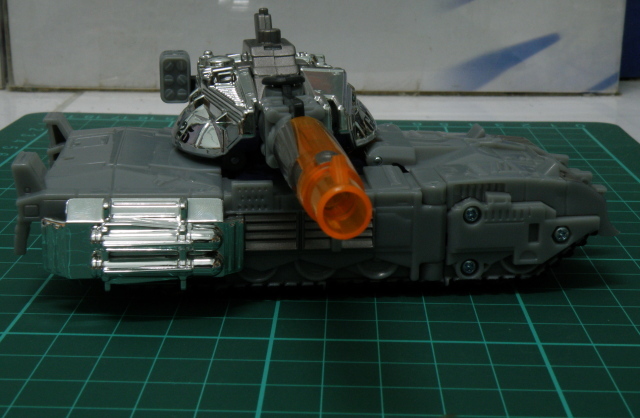 Galvatron alternate mode tank front view. 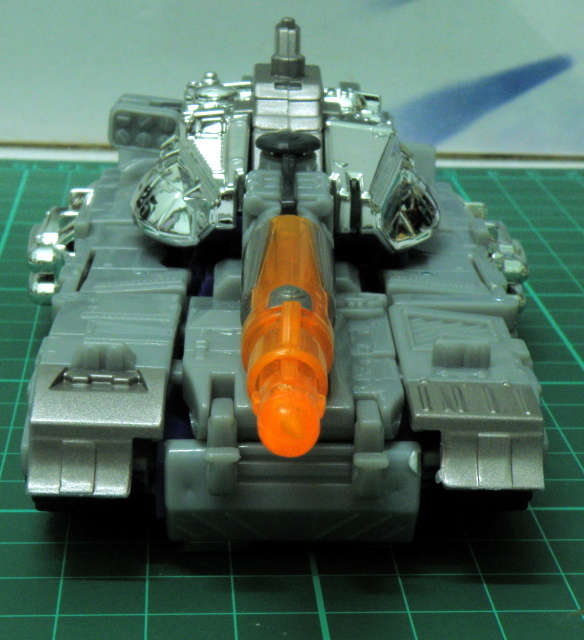 Galvatron alternate mode is a modern battle tank with a rotatable turret which at the side has a small missle pack. Its turret and the side of the back of the thread is chromed. Which is rather unfortunate as it is critical parts for the transformation. 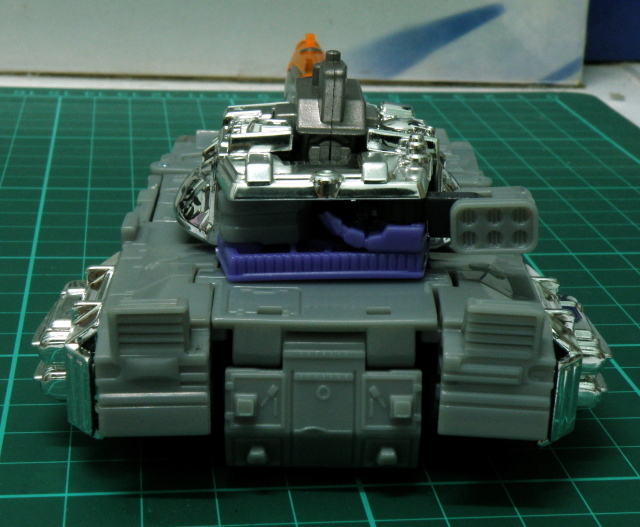 Galvatron alternate mode is not without it charms, the propotion of the tank is commendable, the turret which can be rotate is an additional point. 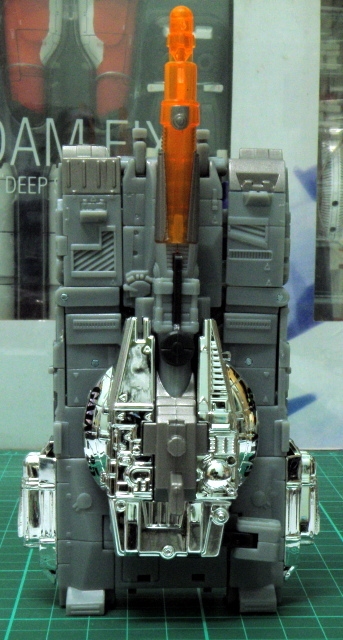 The underbelly of the tank shows the belly of Galvatron robot mode. It is a consistency of the Henkei and Transformers universe classic toy line. Unfortunately the threads is molded plastic and is not movable. The tank movement can only be simulated with the help of 4 tiny wheels. 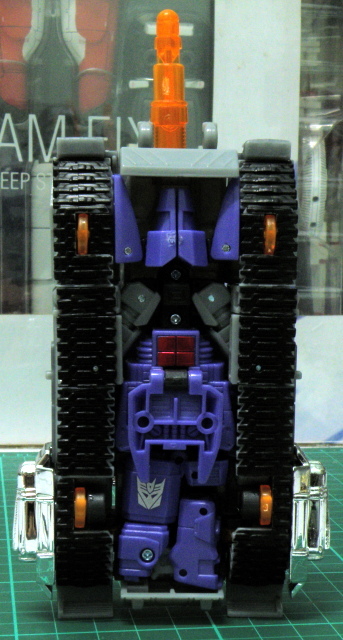 Galvatron tank mode left side. At its left side, the rocket pack is not visible. On the right side, the details is added with a rocket pack. The tank mode can have its turret turn 180 degress but unable to turn 360 due to the toy design. Galvatron tank pose variant 1. The projectile needs to be handled with care for there is no space. 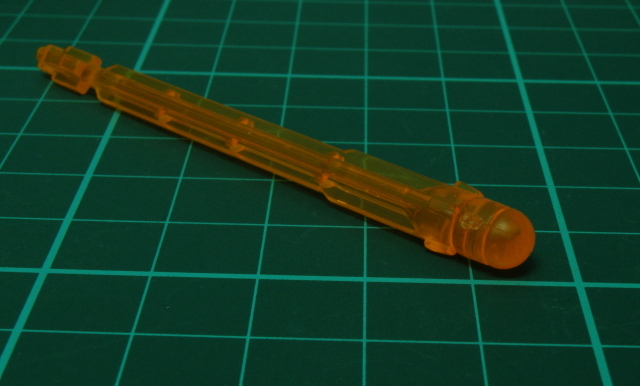 It is just a piece of plastic molded in translucent orange. The fun factor for the alternate mode is the turret. Simple designed yet it fulfills and made the tank more complete. Galvatron tank mode pose variant 2. The one thing to gripe on the tank mode is it is abit floppy at the joints holding the thread to the tank main body. To be continued to Galvatron robot mode. This entry was posted in Mecha, My Hobbies, Transformers and tagged Alt mode, Alternate mode, Decepticon, Destron, G1, Galvatron, hasbro, hasbro transformers, henkei, review, takara tomy, takaratomy, transformer, Transformers, transformers classic by KarMeng. Bookmark the permalink.